When conventional medical and surgical procedures are insufficient to help a patient, organ and tissue transplants are sometimes the only solutions. From a blood transfusion to multiple organ transplants, the procedures and mechanisms associated with these diverse medical interventions all fall under the common area of medical practice known as transplant medicine. The beginnings of successful tissue and organ transplant can be attributed to Karl Landsteiner, an immunologist and pathologist who received the 1930 Nobel Prize in physiology and medicine. In 1901, Landsteiner discovered that there were four different blood types. He called these the A, B, AB, and O types and established that transfusion was possible between individuals having the same type, while mixing of incompatible blood could lead to death due to immune system actions. Because the goal of histocompatibility and immunosuppression transplantation is to insure that the recipient does not reject the transplant but lives with it for the rest of his or her life, histocompatibility and immunosuppression are critical aspects of transplant medicine. A tightly linked cluster of genes known as the major histocompatibility complex (MHC) governs tissue and organ compatibility between individuals. This complex is located on chromosome 6 in humans. These genes regulate the expression of the human leukocyte antigens (HLA) on the cell surface that, in turn, regulate the immunologic reactions associated with organ and tissue transplantation. Because the donor tissue is seen as foreign, it is necessary to suppress the body's natural defense systems to prevent rejection. The drugs cyclosporine, prednisone, and azathioprine are used to accomplish this goal. 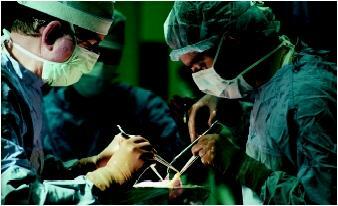 Organ and tissue transplants are also called grafts. Homografts (allografts) are obtained from individuals of the same species. Homografts are usually rejected unless immunosuppressive methods are used to prevent the recipient from immunologically attacking the donor tissue. If a tissue is removed from one part of an individual's body and grafted onto another part of the body, it is termed an autograft. This is a common procedure in the treatment of burn victims. Isografts involve transplants between identical twins or between members of a very inbred species. In these situations there is no tissue rejection due to the similarity in the HLAs expressed on both the donor's and the recipient's cells. Heterografts (xenografts) involve tissue transfer between individuals of different species, such as transplanting a heart valve from a pig to a human. While tissue compatibility is the principal determinant in the success of a transplant, some grafts, such as the skin allografts, are intended for short-term use, to prevent the loss of fluids and infection in severely burned individuals. Even though the graft will be rejected relatively soon, it allows the victim time to recover. Surgeons at the University of Pittsburgh Medical Center prepare a human kidney for transplanting. transplants such as the heart, liver, and kidney, to multiple-organ transplants involving the heart and lungs or the kidney and pancreas. Corneal transplant is considered in cases of deformity in the shape of the cornea or corneal disease preventing the proper transmission of light to the retina. Corneal transplants were first performed in 1920. Due to a lack of extensive blood supply to this tissue, it was thought that histocompatibility issues would not be significant. While this was generally true, it has been shown that corneal graft rejection is an issue in approximately 10 percent of the surgeries. If a person's kidneys fail to remove metabolic wastes from the blood, the only available options are usually hemodialysis or a kidney transplant. A kidney obtained from a living relative or an unrelated histocompatible donor, or from a cadaver, is used to replace the diseased organ. The liver is responsible for filtering the blood and also for producing blood-clotting factors. Conditions such as cirrhosis and cancers involving the hepatocytes (liver cells) or the bile ducts (which convey the bile juice to the duodenum) are treatable by liver transplant. This is a complex procedure that needs to be done rapidly due to critical functions of the liver that cannot be duplicated artificially. In 1967 in Cape Town, South Africa, a surgical team led by Dr. Christian Barnard performed the first heart transplant. His patient survived for a few weeks after the operation, but died of pneumonia soon after. His second patient, however, survived for a year and a half after the operation. Heart transplants were not a very successful procedure until the discovery of cyclosporine in 1980. Since then, heart transplant operations have become much more common with the average postoperative survival period being close to five years. Heart transplants may be the only solution if a patient experiences coronary artery disease (blockage of the arteries supplying blood to the heart itself), cardiomyopathy (thickening of the heart walls), heart valve disease with congestive heart failure (weakening of the heart muscle and an associated failure of the heart valves to regulate the passage of blood), or severe congenital heart disease. Individuals who have conditions such as emphysema, pulmonary fibrosis, or cystic fibrosis and accompanying heart failure, or who have pulmonary hypertension with associated heart failure, are potential heart-lung transplant candidates. Strategies involving the development of artificial tissues and organs are also being developed. In May 1998, the U.S. Food and Drug Administration approved Apligraf, an artificial skin manufactured by Organogenesis, Inc., as a biomedical device. It is made up of the same two layers, the dermis and epidermis, that make up human skin. This was the first living, tissue-engineered product to become commercially available. It has demonstrated effectiveness in the repair of skin lesions, and its use in patients with burns and diabetic ulcers is being investigated. Additionally, cartilage obtained from damaged knees has been used to engineer tissues for knee repair. Complete structural recovery is possible in about a year. Research is occurring in the development of "neo-organs," which involves injecting cells into a three-dimensional matrix made of biodegradable polymers . These cells gradually replace the matrix, leaving behind a new organ. 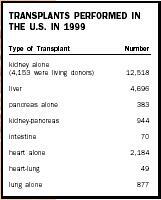 1999 Annual Report of the U.S. Scientific Registry of Transplant Recipients and the Organ Procurement and Transplantation Network: Transplant Data 1989–1998. Rockville, MD, and Richmond, VA: HHS/HRSA/OSP/DOT and UNOS, 2000. Available at <http://www.unos.org/Data/anrpt_main.htm> . Finn, Robert. Organ Transplants: Making the Most of Your Gift of Life. Cambridge, MA: O'Reilly & Associates, 2000. Guyton, Arthur C., and John E. Hall. Textbook of Medical Physiology, 10th ed. Philadelphia, PA: W. B. Saunders, 2000. Mooney, David J., and Antonios G. Mikos. "Growing New Organs." Scientific American 280, no. 4 (1999):60–65. Transplant Patient DataSource. Richmond, VA: United Network for Organ Sharing, 2000. Available at <http://www.patients.unos.org/data.htm> . The fact that someone made an article of information about this is really cool because when my little brother andrew was three he had a kidney transplant that came from a college football player who got hit with the football too hard and it killed him instantly!!!! my brother is now 10 years old and healthy as ever thanks to that football player being an organ donor!!!! so i just wanted to say thank you to those of you who care to be donors!!! !